We had so much fun creating the Rudolf Races that my kids begged me to come up with a new race. 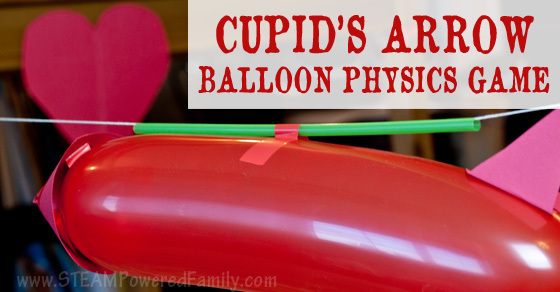 With Valentine’s Day around the corner I had the perfect idea: Cupid’s Arrow Balloon Physics Challenge! A fun way to learn Newton’s Third Law of Motion, while getting students up and moving. 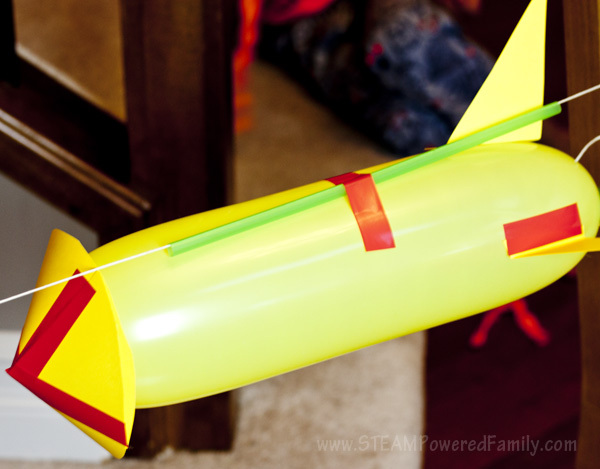 The goal of this balloon physics challenge is to create your arrow out of a balloon. 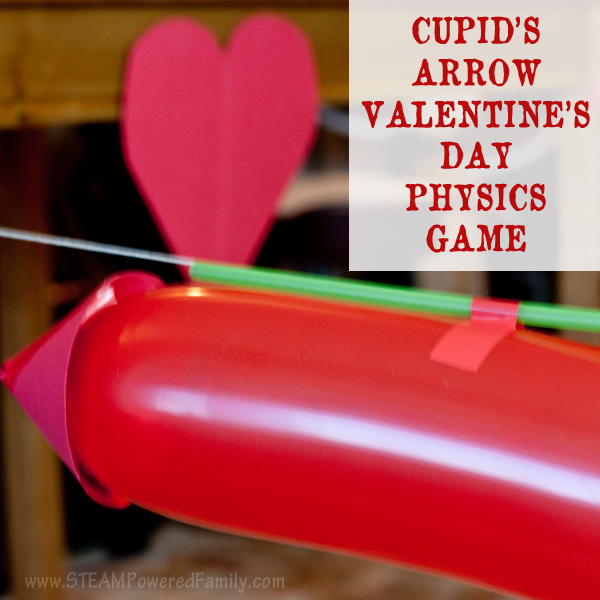 Then, using Newton’s third law of motion, have the arrow shoot along a string into a heart. Newton’s Third Law of Motion states: For every action, there is an opposite and equal reaction. 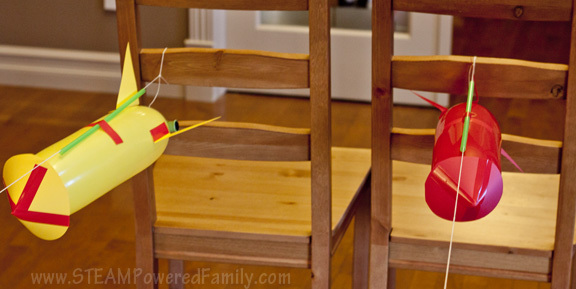 Long, skinny balloons – these were surprisingly hard to find! Blow up your balloon or use a hand pump if you have one. Secure the end with an alligator clip so no air escapes. 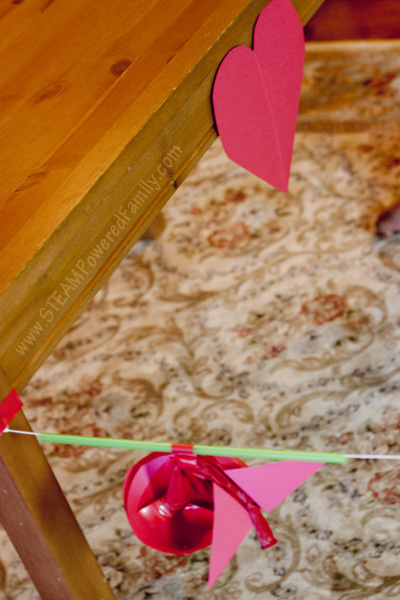 Decorate your balloon to look like an arrow using construction paper and tape. Set up your anchor points about 10 feet apart. ADAPTATION NOTE: What happens if you move the anchor points farther apart? Record the results and determine the distance your balloon can travel. Or change how much you inflate the balloon. How does that affect the results? Thread your string through a straw, then secure the string to the two anchor points. For fun, we attached a heart at the destination anchor point on our race course. 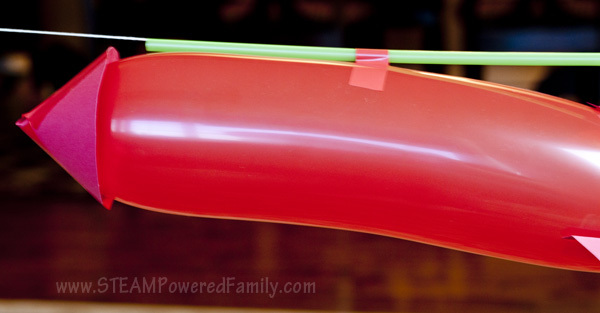 Attach your balloon to the straw using tape. Pull the balloon back to the starting point. Carefully remove the clip and pinch the end between your fingers. Get ready for the countdown! Let go of your balloon and watch your balloon arrow race to the heart! By the time it arrives at the heart it’s a very sad looking arrow. But you can blow it up and do it all over again! 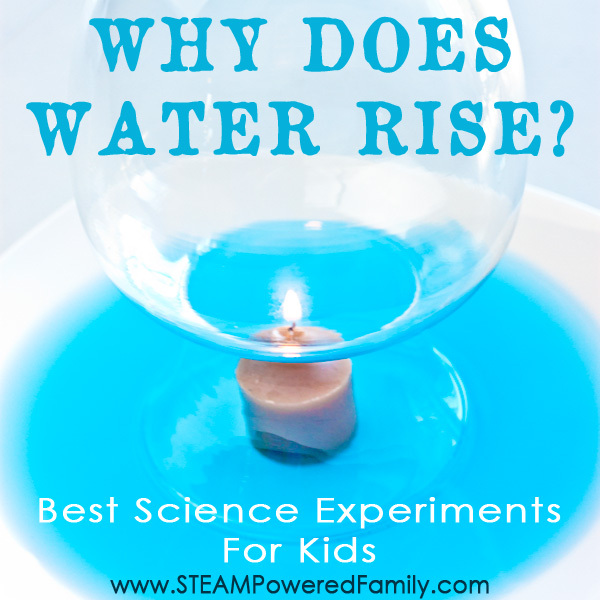 When you blow up the balloon you are filling it up with air that is under pressure. 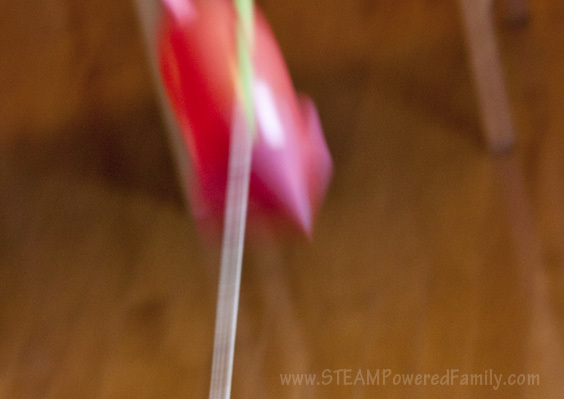 When the air escapes from the balloon (when you remove the clip) the escaping air exerts thrust or force on the balloon which propels it forward. The air escapes backward – the balloon races forward. Action – reaction. Or more formally known as Newton’s Third Law of Motion: For every action, there is an opposite and equal reaction. 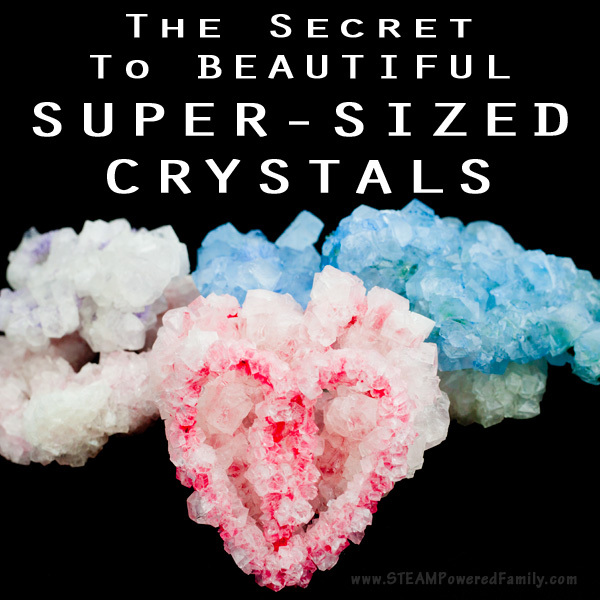 Want even more amazing STEAM Valentine’s Day Activities? 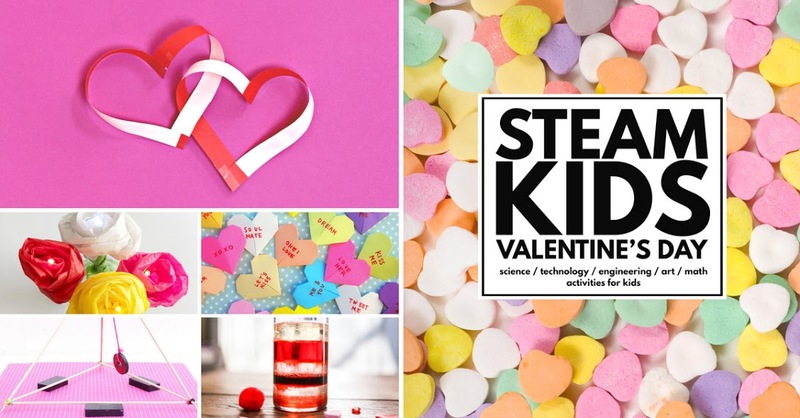 Check out STEAM Kids Valentine’s Day! 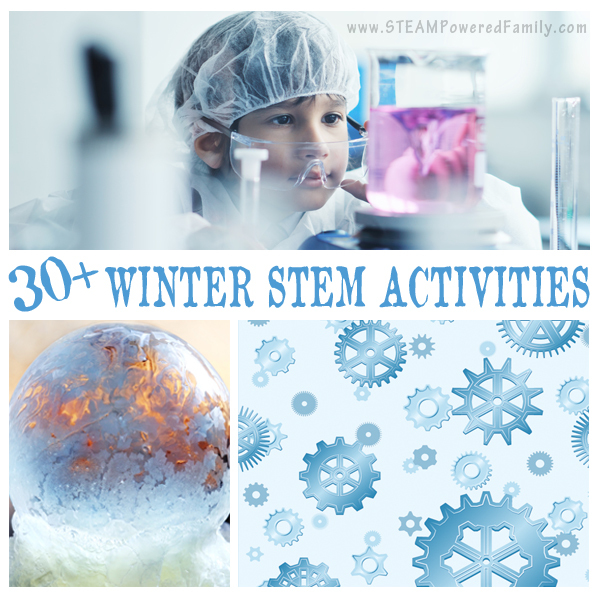 I love this activity – can’t wait to try it! It’s lots of fun! Enjoy!